Your heart beat was there. We took that for granted. We assumed it was “just” and we assumed it would stay. We assumed it would beat long past ours had stopped. Little did we know that it would stop beating a mere 35 weeks in to your existence. Little did we know that all those clothes we bought you would never be worn. Little did we know that your cot would never be slept in. Little did we know that we would never see you with your eyes open. Little did we know we will only ever be able to imagine what your cry sounds like, what your laugh sounds like. This feels so cruel. Through losing you I have met so many other angel parents. None of us deserve this. The only solace I find is knowing that you have some amazing and special little friends with you, wherever you may be. I’m beyond thankful for your angel friends’ mummies and daddies, Otis. I feel like they have weaved a net out of their broken hearts to help lift me up when I’ve needed it. They just “know” … without having to say a word. They know how uncomfortable these shoes are that I now wear for the rest of my life. They know how much I long to take off these shoes and rest sometimes and their support allows me to do that. This road I walk is a long one. I have such a long way to go. It’s painful knowing that I’ll wear these shoes forever, but I know through the guidance of this amazing community that I will be able to rest my feet every now and then, in time. For now, I’m okay feeling this pain. You could even say I tentatively invite it. I LIKE how much it hurts missing you. Not because I like the pain, but because it shows me how much you mean to me. It shows me how much I love you. I know this only hurts so badly because of the immense love I feel for you. I write about you daily. You know mummy enough to know that I’m not an emotional person. I’m quite hard faced with my feelings – I have a good, strong, solid wall built up protecting myself. Writing is my way of expression because of that. If I didn’t write about you then your death would consume me. “What seems like the most fitting title?” … A question I have asked myself over and over. I decided on “After Otis” because that’s how my life is now. It’s divided in to two sections – before you and after you. I promised you that I wouldn’t allow your memory to die with you and I never break my promises, especially to my children. There is so much stigma surrounding child loss and I’ve made it my mission to try and help raise some awareness of stillbirth since losing you. Even if I can be just a tiny part of “ending the silence” on the taboo that is infant death, I know you won’t have died in vain. I just want to make you and your sister’s proud, Otis. I cannot believe it has already been two months without you. The journey of grief I unwittingly became a part of has been the strangest of my life, yet. I HATE how fast it seems to have gone since the day you were born but at the same time, I embrace it. Strange? Probably. That’s the paradox of becoming a bereaved parent. A massive part of me wants that thing we call “time” to speed by, so I can find my new normal and learn to live without you here. But, at the same time, losing you being so raw and so new makes me really FEEL close to you and I need that. I need to feel how much I miss you, every second of every minute of every hour of every day. I need to feel the remnants I have left of you on my body; the post pregnancy aches, the mummy tummy in which you lived and died, the enlarged and tender breasts that would have been used to nourish you and help you grow. I don’t know what to do, Otis. I have such an amazing support network. Your name is spoken daily in our household and I’m surrounded by people who love you and care for you; who talk about you and your existence; who acknowledge not only your death, but your life too. Yet, I still feel so lonely. There isn’t a single word in existence that could possibly describe this ache and longing I have for you. My arms ache to feel your 5lbs1oz weight in them. My chest aches to feel you nestled in to it at night while I cuddle you to sleep. My eyes ache to see you. My ears ache to hear your cry for the very first time. This is so hard. I never in a million years expected this to happen to us, you know. But who does? It just doesn’t happen to people like us, right? I would breathe my very last breath right now if it meant you would take your first. 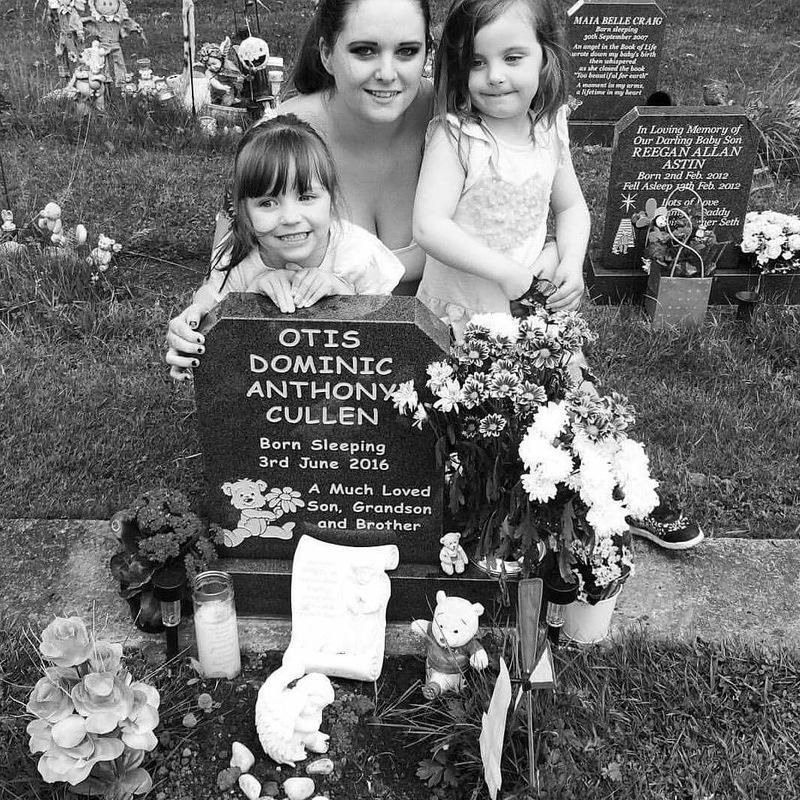 Otis Dominic Anthony Cullen: I miss you, I love you, I will do both eternally.